Having received such awards as the Community Spotlight Award from the Greater Fort Worth Builder’s Association and Tree City USA from the Arbor Day Foundation, Kennedale has become known not only as one of the most well-managed communities in Texas, but also one of its most innovative. 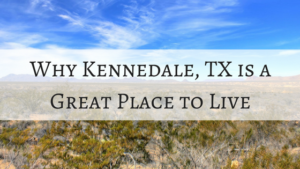 From its beginnings when Native Americans hunted along Village Creek to its present-day transition to a thriving suburban area, Kennedale has proven itself to be a great place for anyone to call home. With a population of just under 10,000 residents, it’s small enough to let you know your neighbors yet large enough to have numerous suburban amenities. Because of this, Impression Homes is constructing many new homes in Kennedale, in The Glen of Village Creek community. Why is Kennedale so special? While there are many small cities across the United States that are special in their own unique ways, those who live in Kennedale know it has a charm all its own. Offering a mix of activities for residents young and old, more people than ever are discovering the numerous benefits of living in Kennedale. Whether it’s kids attending a football camp or playing baseball through the Kennedale Youth Association or older residents heading to the Senior Center for a game of bingo, to watch a movie, or participate in a wellness class, it’s crystal clear Kennedale has something to offer everyone. Before any family considers moving to a new city, it’s a given they want to know about the quality of the local schools. For those who choose to call Kennedale home, they quickly discover they have found a truly wonderful school system that takes its responsibility seriously. With numerous Kennedale High School graduates being awarded college scholarships and other schools in the district earning various academic distinctions for classroom excellence, parents and students both can have peace of mind, knowing faculty and administrators are doing everything possible to help them succeed not only now, but in the years ahead. Why build a new home in Kennedale? If you’re looking to build a new home that is customized to your specifications, then look no further than Kennedale. To make your dreams come true, consider the latest community DFW home builders, Impression Homes, is building in, The Glen of Village Creek. With its easy access to I-20, proximity to Fort Worth and Arlington, and abundance of gorgeous trees and ponds, this community is a must-see for anyone considering a new home in Kennedale. For those who enjoy living an active lifestyle, the 58-acre Southwest Nature Preserve offers plenty of opportunities for hiking and biking, and is located only a short walk away from The Glen. With a wide variety of floor plans available, there’s little doubt this community will fill up fast, so there’s no time to waste when making your decision. Whether you’re a young family looking to settle down or a retired couple who wants to downsize and lead a quiet, laid-back lifestyle, The Glen of Village Creek showcases the very best of Kennedale. Considered one of the top suburbs of Fort Worth for many years, Kennedale is being discovered not only by local residents, but by those across the country seeking a quiet, friendly way of life. With an unemployment rate of 4.2 percent and a thriving business climate, there’s no better place to live than Kennedale. Whether you’re meeting friends at Reds Roadhouse or enjoying a delicious seafood meal at Louisiana Catfish on the Kennedale Parkway, you’ll quickly find out what makes this city a true Texas treasure. Contact Impression Homes today to learn more about available homes in Kennedale, TX!